Planting a hummingbird garden filled with nectar-rich, long-blooming Salvias aids preservation of the 16 hummingbird species that migrate each year throughout North America. A hummer garden also gives you a front-row seat to a fascinating aerobatics show. Hummingbirds can fly forward, backward and sideways or hover in place in rain as well as sunshine. Sometimes they dive bomb each other over territorial matters, such as favorite flowering bushes or feeders filled with precious sugar water that they tank up on during migrations of up to 2,000 miles. One miracle of the natural world is the nonstop flight of the species Archilochus colubris (Ruby-Throated Hummingbird) -- the world's most widely distributed hummingbird -- from Texas and Louisiana across the Gulf of Mexico to get to the Yucatan Peninsula. The journey of approximately 600 miles requires endurance and lots of fuel for a trip across water during which there are no breaks for rest or food. Backyard islands of colorful sages are like gas stations for these long-distance travelers. Depending on where you live and what plants you grow, your garden may whir with the helicopter-like flight of hummingbirds from spring into autumn as they flit from one flower to the next. If you live in a mild climate and plant winter-blooming sages, you can also enjoy hummers during the cool season. The Anna's hummingbird is a regular winter resident in many Northern California gardens. Researchers and birders have recorded a number of other species overwintering in the American South. There are more than 300 species of hummingbirds worldwide. All are native to the western hemisphere and live in North, Central and South America. Unless caged and transported across the Atlantic or Pacific, they aren't found in Europe or Asia, because they can't store enough energy to make trans-oceanic flights. We've noticed that hummingbirds visiting our gardens seem to prefer New World sages. The average hummingbird lives for no more than five years. During migration, it revisits gardens containing favorite plants remembered from previous trips. These plants often are ones native to or prevalent in a region, such as the California native Salvia spathacea (Pitcher Sage) -- a hummer favorite on the West Coast. This return-customer behavior is probably related to a phenomenon called co-evolution in which fauna and flora develop to meet mutual needs. In return for feeding the birds, plants are fertilized by pollen that clings to hummingbird beaks and heads. Here's an example of how bird and plant must match to meet each other's needs: Although North American hummingbirds enjoy the nectar that they struggle to reach within the 5-inch long flowers of Salvia dombeyi (Giant Bolivian Sage), their beaks and tongues aren't long enough to reach the bottom of its flowers and pollinate them. 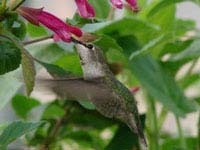 Back home in the plant's native lands of Bolivia and Chile, there are hummingbirds with beaks as long as the blossoms. Co-evolution also involves color and fragrance. While honeybees and butterflies are drawn to color, they find fragrance powerfully alluring. In contrast, hummingbirds have little sense of smell. It is bright or deep rich colors that attract these major pollinators of sage. Considering the theory of co-evolution, it isn't surprising that sage flowers often are colorful but not fragrant and that they are deep and tough enough for the needle-like beaks of hummers. You could say that sages fit the bill. When planting a hummingbird garden, it's best to include lots of sages that are native to or common in your region. For example, no Southwestern hummingbird garden should be without Salvia greggii (Autumn Sage) and Salvia microphylla (Mountain Sage), which are closely related hummingbird favorites providing a wealth of nectar even during heat and drought. In the Southeast, one hummingbird magnet is Salvia coccinea (Tropical Sage or Scarlet Sage), which grows well in the area because it is adaptable to heat and swings in moisture from times with plentiful rain to extended periods without. Yet it takes more than color and nectar to create a haven for hummingbirds. Surrounding Cover. All birds need safe havens for short rests, overnight stays or more permanent digs, such as nests. Look closely if you want to find a hummer nest; a ruby throated hummingbird's home is less than three inches in diameter. All birds are more likely to visit your yard if it includes trees and shrubs that are a quick hop or flight away from neighborhood cats and other predators. Foliage on these larger plants is also good for providing shelter from rain, wind and sun. Water Features. Hummingbirds are classified as being 'apodiform,' which means that their legs are tiny and primarily suitable for perching. A birdbath with water deep enough for songbirds is too deep and slick for hummers. You can modify it by adding a layer of small rocks to decrease depth and provide a textured perch. However, what hummingbirds really enjoy is some sort of misting device attached to a birdbath so they can dart back and forth through the spray. They also like to clean up by rubbing against the leaves of wet foliage, so place the birdbath and mister near bushes. Insect Protein. Many kinds of tiny insects are protein sources for hummingbirds. They are natural pest exterminators that eat ants, aphids, midges, tiny caterpillars, mosquitos, beetles, whiteflies, weevils and insect eggs. You can increase this banquet for hummingbirds by placing soft, rotting fruits near bushes to attract insects. Supplemental Feeders. Although the first rule for attracting hummingbirds is grow nectar-filled, flowering plants, adding a number of bottle feeders to your garden can also increase your hummingbird population. It's probably a wise idea to hang more than one; otherwise it may become a battle site for hummers competing for its juice. We have more sage words for you about how to attract hummingbirds. Next up, we'll explain how to use and clean feeders and birdbaths to keep your winged guests healthy. Then we'll talk about what kinds of Salvias to plant to turn your yard into a hummingbird hotel for at least three seasons and, perhaps, year round. Meanwhile, please contact us if you have any questions about hummingbird sages for your area. We'll be glad share the buzz with you about our favorite whirlybirds.